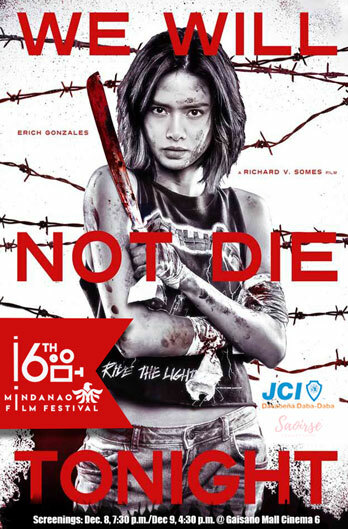 The action film “We Will Not Die Tonight” starred by Dabawenya actress Erich Gonzales will have two special screenings at the the 16th Mindanao Film Festival in Davao City. This will be on Dec. 8, 7:30 p.m. and Dec. 9, 4:30 p.m. Directed by Richard Somes, the movie is Erich Gonzales’ first foray into the action genre, she also one of the film’s co-producers. The film screenings are organized by the Mindanao Film Festival and the JCI Davaoeña Daba-Daba. The screenings will be held at the Gaisano Mall of Davao Cinema 6. The December 8 screening will be graced by the presence of film director Richard Somes and actor Paolo Paraiso who plays the film’s main antagonist. “The movie where we have an empowered female action heroine, resonates with JCI Davaoeña Daba-Daba who are also women in action, working to make into reality numerous projects and advocacies for the community,” says Barbie Blanco JCI Davaoeña Daba-Daba president. Among the group’s projects include; Book Your Future-a book drive for rural schools, Good Hair Days/Ground Zero Year 2 which is an entrepreneurial drive to minimize the use of single-use plastics and Oplan Kaagapay a donation drive for victims of recent big fires in Davao City. “Women in Action translates into breaking stereotypes. That women can also become gutsy action heroes not just in the movies but also in real-life engaging in different endeavors and noble pursuits,” Blanco said. Rudolph Alama, festival director of the Mindanao Film Festival says women have played a key role in the development of regional film movement in Mindanao. “We have lots of women filmmakers here in the region and they also are women-in-action, it takes a lot of guts and hard work in making films, in fact our opening film Kauyagan is made by a lady filmmaker from Cagayan de Oro, Julienne Ilagan,” Alama said. This year’s 16th Mindanao Film Festival is the largest ever in the history of the MFF with 107 films from across Mindanao and some overseas selections. These films will be screened during the week-long festival slated December 5-11 at Gaisano Mall Cinema 6. For ticket reservations, please message JCI Davaoeña Daba-Daba, Pres Barbie Blanco, Project Chairladies Dixie Urvistondo and Joselle Amarado Gorro. PM them for the ticket price.